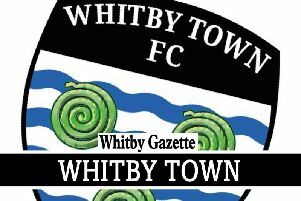 Whitby Town will be hoping to bring to an end a run of three successive defeats when they host Ashton United tonight (Tuesday). And boss Chris Hardy has stressed that it is crucial his side take something from the game after losses to Grantham, Hyde United and Rushall Olympic saw the Blues drop back into the Evo-Stik Premier Division’s relegation zone. “After three back-to-back defeats, the importance of getting a positive result from this fixture is of the utmost, especially given the fact that teams in and around us seem to be picking points up themselves,” he said. “Despite the three losses, there is still reason to be confident going into this fixture as we continue to create goalscoring opportunities on the back of some good, controlled prosession. “That being said, we know as a group there is a real need to improve in both boxes, and I’m sure that these small margins resulting in defeat will very soon swing back in our direction. “Having faced Ashton twice already this season during my time as Guisborough manager, I do have an idea what to expect from them. Centre-half Richard Pell will miss out due to work commitments, while midfielder Ross Gardner has left the club, citing a lack of playing opportunities as the reason behind his departure. Without these players at his disposal, Hardy will include youngster Jake Maughan and dual-signed Guisborough Town midfielder Gary Wood in his squad for the clash, which kicks-off at the Turnbull Ground at 7.45pm.